Editor's Note: This is the first in a series of articles about the behind-the-scenes people at Borchert Field, the people essential to the team's operations but whose contributions have gone largely unsung. Of course Borchert Field is remembered for its short distances down the right and left field lines, the close proximity of the fans to the players, the characters who played ball there, and the equally quirky owners. But, let us not forget the people who made things work at the park. Those unsung heroes who need recognition, even today. 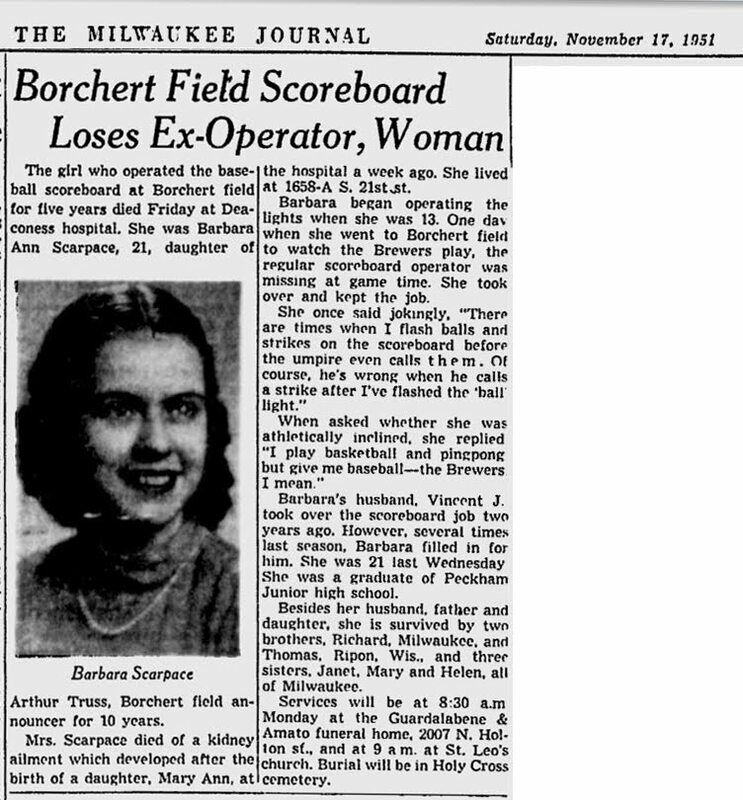 Barbara Ann Scarpace operated the scoreboard at Borchert Field for five years in the late 1940s. Barbara was the daughter of Arthur Truss, the Borchert Field announcer. Barbara began her career at Borchert operating the lights when she was 13. One day attending a game the regular scoreboard operator did not show by the start of the game. Barbara took the position and kept the job. She once joking said: "There are times when I flash ball and strikes on the scoreboard before the umpire even calls them. Of course, he’s wrong when he calls a strike after I've flashed the ball light." Barbara's husband, Vincent, took over the scoreboard job for the 1950 season, but Barbara still filled in for him several times. 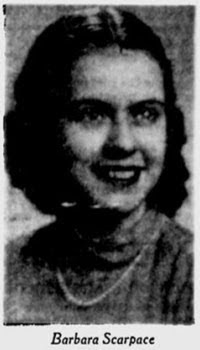 Barbara Scarpace died November 16, 1951, just twenty-one years old, of a kidney aliment that developed after giving birth to a baby girl. She was one of the unsung heroes of Borchert Field. Hopefully, just like the park itself, we will not forget the people who helped make it an unforgettable place. CHICAGO, Oct. 20 – Here's Heinz Becker, of whom the Chicago Cubs expect great things in the area around first base and home plate. He began his baseball career with Dallas and then went to the Milwaukee Brewers where his hitting attracted more attention. The Cubs got him at the end of this season, to play first base&mdashand to hit, they hope. Not only an interesting look at the movement of players in 1942, but also a peek into the world of pre-Photoshop photo editing. Only his socks and shoes are spared the combination of airbrush and correction fluid. 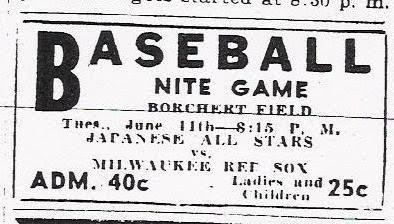 On Tuesday, June 11, 1935, a baseball game was played at Borchert Field at 7th and Chambers Avenue between a team of Japanese All-Stars and the Milwaukee Red Sox. The game was scheduled to start at 8:15, "under the new floodlights", admission being 40 cents, with a lower price for ladies and children. The Milwaukee Red Sox were made up of leading AAA and semi-professional players from Wisconsin. Managed by Al Moran and Eddie Stumpf—who also acted as the club’s general manager, the team played in the Chicago City League, as well as against other independent teams across the country. This Japanese All-star team was made up of ex-college and ex-prep school players, and had enjoyed great success on their US tour, which had begun early in the spring of that year, playing minor league and local semi-pro teams. Lefty O’Doul, then managing the San Francisco Seals, named the All-Stars the "Tokyo Giants" for promotional purposes on the tour. The All Stars played the eight teams of the Pacific Coast League, winning 6 and losing 17. Entering Milwaukee, the Giants' record on the American tour was 59 wins, 30 losses and one tie. It was reported in the Milwaukee Sentinel that the Japanese players played the game as well as Americans, except they did not hit as well. The "new floodlights" at Borchert were just that, NEW. As of June 1 the Brewers' home attendance was only 27,820 for the entire season, or 1,397 behind 1934. To help boost attendance lights were placed in the outfield. As can been seen in this photo, the light towers were placed in the playing area of the outfield. The Wisconsin News reported the infield at Borchert was illuminated by 49 foot candlepower, compared with 40 at the Columbus American Association park. The lights in Cincinnati's Crosley Field shed 71 foot candlepower. A foot candlepower equals the amount of light given by one candle at a distance of one foot. The cost of electricity at Borchert was reported as 18 cents an hour. There was a dress rehearsal for the night game on Tuesday, June 5, and everyone was pleased with the lights. 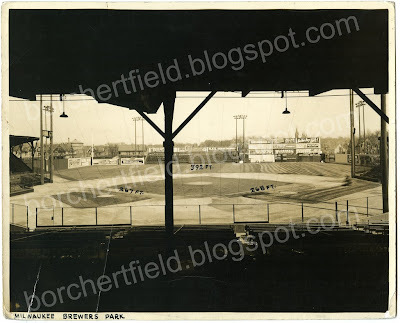 The first official night game at Borchert was played on Wednesday June 6, 1935, only two weeks after the first night game in the major leagues at Crosley Field in Cincinnati. That night Barbara Bendinger, 7-year old daughter of the Brewer president, pulled the chord at the pitcher's mound to turn on the lights. She then walked off the field carrying a bouquet of flowers almost as big as herself. Only 4,747 paid customers were at the game—the Brewers losing to the St. Paul Saints 7 to 3—cold weather and a threat of rain kept attendance down. Reports published in the paper showed the lights were unanimously approved of. The Brewers were so pleased with the lights and the boost in attendance that they switched the scheduled day game the next day to a night game. This left the two teams only 20 minutes after the game to get to the train station, as the Brewers traveled to Minneapolis and the Saints returned home. 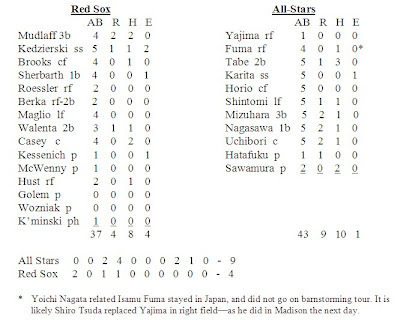 Thus only 5 days after the first night game at Borchert Field, the Japanese All-Star team met the Red Sox in only the third night game in Borchert's existence. Publicity before the game told of the differences between the Japanese players and their American counterparts. 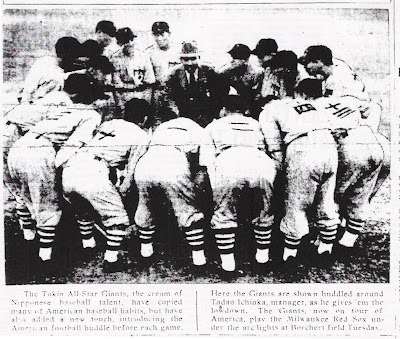 One feature the Japanese team picked up in America (but not from baseball) was the huddle to discuss strategy. The game on June 11 was attended by about 1,400 at Borchert Field. The Japanese All-Stars won 9 to 4, "with a masterful exhibition of fielding, timely hitting and some really high class flinging by Eiji Sawamura, the 18-year old ace of all Japan". (He was reported as being 17 in the Wisconsin News.) Toshihide Hatafuku started for the All-Stars and pitched the first three innings. Sawamura pitched the last six innings, allowing 6 hits and striking out 9, en route to being credited with the win. Sotaro Suzuki, the All-Stars business manager, explained he was forced to pitch the youngster more than he had planned on the tour, as he did not figure on so many doubleheaders. The All-Stars had split a doubleheader Sunday in Chicago, but Sawamura had not pitched. However, he pitched 12 innings the day before the Milwaukee game in Battle Creek, Michigan, (a 12-inning tie game), and 9 innings on Saturday in Detroit. 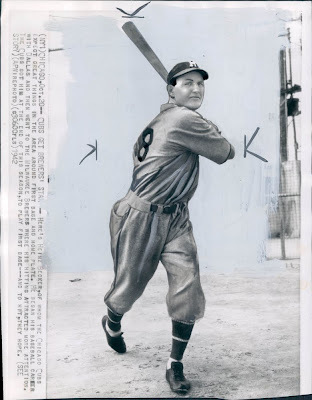 The Wisconsin News told its readers that Sawamura had held Babe Ruth’s American leaguers to five hits the previous winter, but lost 1 to 0 on a home run by Lou Gehrig. "He is something of a national hero", the paper reported. Larry Kessenich—a former local sandlot star—started for the Red Sox, but was forced to leave the game when he was hit in the stomach by a line drive in the third inning. Doug McWeeney—a former major leaguer and former Milwaukee Brewer—then took over. McWeeney gave up four runs in the fourth inning to take the loss. One odd moment in the game occurred when the Red Sox’s catcher, Bob Casey, was ejected by the umpire for arguing balls and strikes. 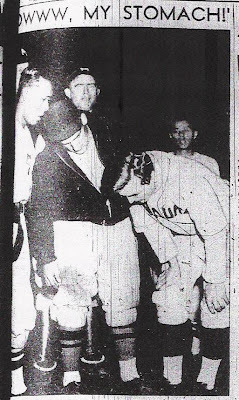 Manager Eddie Stumpf pleaded with umpire Schiefelbein not to eject his only catcher, and Casey was allowed to stay in the game. However, the real interesting story of this game comes from Yoichi Nagata. Yoichi relates the following account: after the Giants were to leave the field following the game, a man in his 40s came up to Sotaro Suzuki and asked "When do you give me Eiji Sawamura? Schoolboy Sawamura signed with me." This man introduced himself as a baseball scout, showing a player contract signed by Sawamura. The stunned Suzuki asked Sawamura how that occurred. Sawamura explained, "In the pre-game practice, I chased a loose ball to the outfield, where he came up to me. He wanted me to sign the paper. I thought he was a fan seeking my autograph". Business Manager Suzuki refused the man's request for Sawamura. However, the scout did not retreat, saying that he would bring this case to the Baseball Commissioner. Suzuki countered "It is no problem. The Tokyo Giants are not in organized baseball." Milwaukee Red Sox manger Eddie Stumpf and Ralph Siners, who were at the field, seconded Suzuki. Eiji Sawamura and the Tokyo Giants continued their barnstorming tour, however, it was said it had cost Suzuki some money to get the contract back from the scout. Who was the scout? Sotaro Suzuki at one time said he was a St. Louis Cardinal scout, and another time a Pittsburgh Pirate scout. Another source reported the man scouted for an American Association team. The day following their win over the Milwaukee Red Sox, the All-Stars played the Madison Blues in Madison, before a record attendance of 4,601. The Madison team won 9 to 3. The Tokyo Giants finished their 109 game tour, including 5 games in Hawaii, with 74 wins and 34 losses, plus the one tie. Eiji Sawamura is a legend of Japanese baseball. He was born on February 1, 1917, in Ujiyamada, Japan. He first gained fame on November 20, 1934, in a game at Kusanagi Stadium in Shizuoka, Japan, against the barnstorming team of American major league players mentioned above in the Wisconsin News. The 17-year old started and completed the game, giving up 5 hits and striking out 9 in eight innings (the Americans were the home team), including Charlie Gehringer, Babe Ruth, Lou Gehrig and Jimmie Foxx in a row. Sawamura did give up a home run to Gehrig in the seventh inning—thus losing 1 to 0. 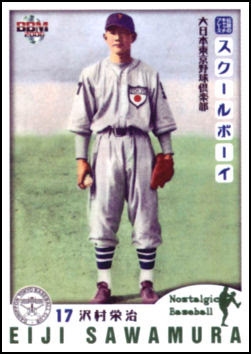 In 1936 Sawamura recorded 14 wins against 3 losses with the Tokyo Giants in his first professional season in the Japanese League. (The league had a spring fall split-season; Sawamura had a 1 and 1 record in the spring, and 13 and 2 record in the fall season). On September 15 he pitched the first no-hitter in that league. In 1937 Sawamura went 33 and 10 for the entire season (24 wins against 4 losses in the spring, 9 wins and 6 losses in the fall portion); pitching another no-hitter, and being named the MVP in the spring season. 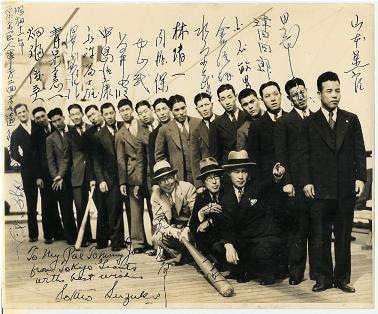 In January 1938 Sawamura was drafted into the Japanese military, and served three tours of duty. He injured his shoulder while in the military and was never again a dominant pitcher. However, in parts of three seasons in the 1940s he had a 16 and 9 record, including his third no-hitter. On December 2, 1944, the transport ship carrying Eiji Sawamura was sunk by an American submarine. Eiji Sawamura was dead at the age of 27. In 1947 the Japanese Baseball League began awarding the Sawamura award to the league’s best starting pitcher each year, similar to America’s Cy Young Award. The award is still given out. Eiji Sawamura was inducted into the Japanese Baseball Hall of Fame in 1959.